What are the 5 top concerns when patients evaluate choosing a plastic surgeon? In an informal survey of my patients, I have found that websites and social media play a bigger role than I would have acknowledged in the past. #1 Satisfaction/Experience of family members and friends: Personal recommendations play a significant role for choosing a cosmetic surgeon. I am fortunate in this regard because I have been in practice in my community for over 30 years. I was surprised to discover how few patients consider training and board certification as important criteria when choosing a surgeon. While personal recommendations are a valuable tool, I would also caution patients to check on the credentials of any physician they are considering. #2 Ease of Having Questions Answered: Office consultations play a major role when patients are actively looking to have cosmetic surgery. I find that patients often look to establish a rapport with the surgeon and his staff. This is sometimes referred to as “bedside manor.” However, I think that today’s cosmetic surgery patient wants to feel that a surgeon is sensitive in addressing their personal concerns and takes adequate time to answer their questions and to explain the procedure and perhaps most importantly, offer them options for treatment. Too frequently I hear that patients have not been given a choice when procedures are discussed during consultations. I feel strongly that there should be a patient/surgeon partnership in this regard. #3 Before/After Photos: Since cosmetic plastic surgery is unlike other surgical specialties, the visual results are a surgeon’s real true test of skilfulness. Most websites include a selection of Before and After photographs and I encourage patients to ask to see more during an office consultation. While photos are not a definitive way to judge your own possible result, they are an excellent indicator of the aesthetic style of the surgeon. Does every nose look-alike? Does the facelift result look natural? Can you imagine yourself pleased with similar results? #4 Responsiveness During Recovery: Unlike most other medical procedures, I believe elective cosmetic surgery has an important service component. Seeking treatment is voluntary and patients play a significant role in their recovery. I find that my patients are comforted in knowing that they can reach me 24/7 following their surgery. It is my philosophy that patient questions or concerns are better answered quickly to alleviate possible undue worry and eases the recovery process. #5 Comments From Family and Friends: We have come full circle, because just as important as getting referrals from family and friends, so are their comments following a cosmetic surgical procedure. Assuming a patient has shared the news that they have had surgery; positive feedback seems to be crucial. I guess we all seek validation for our choices in one way or another. 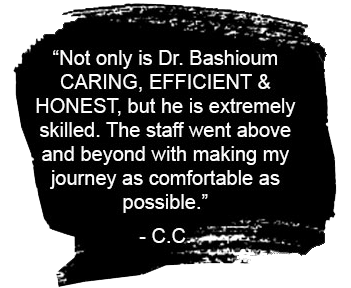 I am always honored when a new patient comes to see me upon the recommendation of a patient or colleague.